Gloria F. Hagen, 84, of Mason City, died on Monday, February 4, 2019 at Muse-Norris Hospice Inpatient Unit in Mason City. A funeral service will be held on Friday, February 8, 2019, at 11:00 AM at Trinity Lutheran Church, 213 N Pennsylvania, with Pastor Kathy Graves officiating. The visitation will be held prior to service time on Friday, February 8, 2019, starting at 9:30 AM, at Trinity Lutheran Church. Following the service, a luncheon will be served for a time of fellowship and remembrance. Interment will be at Sunnyside Cemetery in Lake Mills, Iowa following the luncheon. Memorials can be directed to the family of Gloria Hagen. Gloria Faye Hagen was born in Lake Mills, Iowa, on October 24, 1934 to Elmer and Cora (Petersen) Jensen. She was the fourth of five children. She graduated from Lake Mills High School in 1952, and was united in marriage of that same year on November 2nd to Irvin Hagen. Three children were born to this union, Judy, Gary, and Pamela. 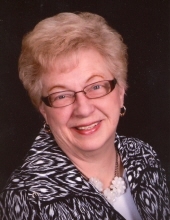 Gloria spent most of her career as the superintendent’s secretary at North Central High School in Manly, Iowa. Some of Gloria’s most cherished pastimes were playing cards, board games, cooking, baking, and socializing with friends. Gloria was an active member of a garden club, book club, bridge clubs and many church circles. Her grandchildren were very important to her, and she loved to spend time with them whether it was camping or attending school functions. Gloria is survived by her three children, Judy (Craig) Goetsch, Gary (Toni) Hagen, and Pamela (Randy) Fike; one sister, Lavonne; two sister-in-laws, Donna and Clarice; eight grandchildren; and eleven great-grandchildren. Gloria is preceded in death by her husband; her parents; three sisters, Evelyn, Marjorie, Charlotte and their spouses; four brother-in-laws, one sister-in-law, and one nephew. To send flowers or a remembrance gift to the family of Gloria Faye Hagen, please visit our Tribute Store. "Email Address" would like to share the life celebration of Gloria Faye Hagen. Click on the "link" to go to share a favorite memory or leave a condolence message for the family.